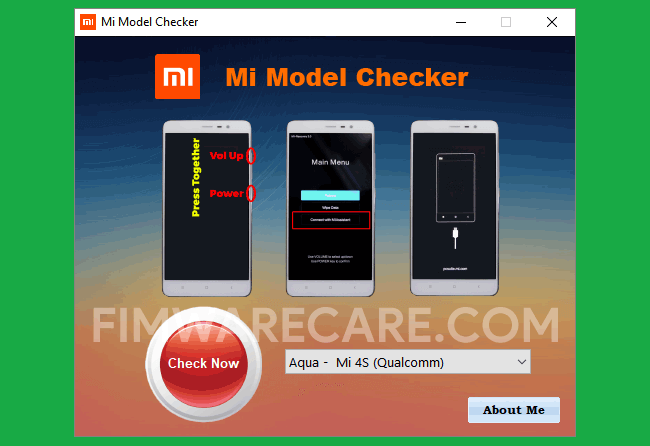 Xiaomi Model Checker is a small application for windows computer which allows you to check the Xiaomi Model number, Serial number, Android Software version in a single click only. The application allows you to get the complete information about your Xiaomi Smartphone and Tablets in single click. You can easily get the Bluetooth Address, WiFi Address, Android Version, Chipset Type, Model Number, Serial Number, Code Name of the device. To use the application you need to install the ADB Driver on your Computer, then after connect your Xiaomi Device to the computer and click on the Check now button to quickly check the information of your Xiaomi device. [*] Compatibility: The Xiaomi Model Checker runs perfectly on Windows XP, Windows Vista, Windows 7, Windows 8, Windows 8.1 and Windows 10 (32 bit and 64 bit). [*] Credits: Xiaomi Model Checker is created and distributed by Pyae Sone Win (developer). So, full credits goes to Pyae Sone Win (developer) for sharing the tool for free.